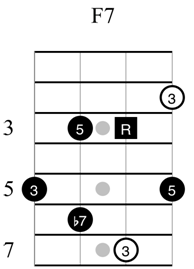 In the Previous lesson , we focused on arpeggios that spell out each chord. 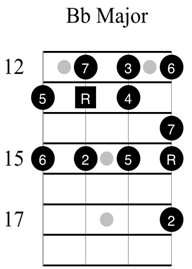 The notes of the arpeggio are identical to the chord and contain the intervals 1, 3, 5 and 7. 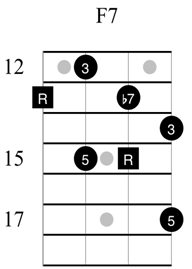 A useful and common technique in jazz and other forms of music is to build a new four-note arpeggio from the 3rd of each chord. Instead of playing 1, 3, 5, 7, we will play 3, 5, 7, 9. The effect of this is to add the richness of the 9th interval to our melodies, and also to avoid the root. You’ve probably noticed by now that resting on the root in the melody can have a bit of a ‘full stop’ to the melody, especially on the tonic chord (BbMaj7). 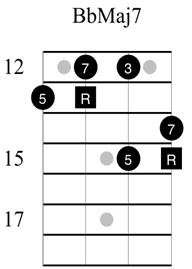 By avoiding the root, we can add richness and momentum to our solos. 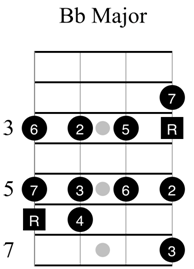 To form a 3-9 arpeggio, begin on the 3rd of the chord and build up four notes. 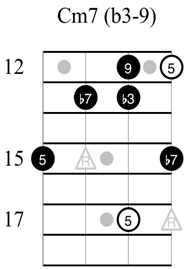 The notes in the Cm7 extended arpeggio are Eb, G, Bb and D.
You may notice that these extended arpeggios form new arpeggios in their own right. 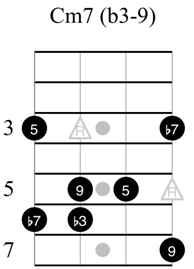 For example, the notes in the BbMaj7 extended (3-9) arpeggio, D, F, A and C, form a new arpeggio of Dm7. Knowing this can be both a benefit and a distraction. 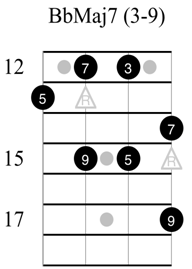 If you’re just starting out with exploring extended arpeggios, it is definitely a distraction, so don’t worry about the theory for now. The roots are included but greyed out for your reference. Do not play them in these arpeggios. 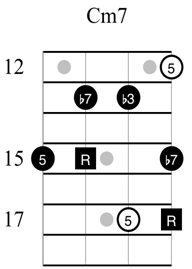 Repeat the process of learning these arpeggios as was shown on page ten. Time spent here will make the following stages easier and quicker. 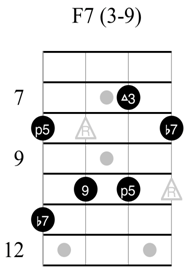 Remember, you only have to learn these arpeggios once to know them for the rest of your career. 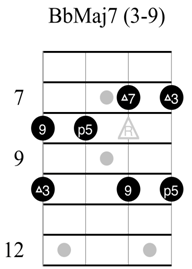 While you’re learning each extended arpeggio it will be of great benefit to hear the original chord playing in the background. This will help you hear the added 9th note in thecontext of the original harmony and teach your ear to ‘accept’ it as a chord tone. Learning music is essentially about learning to hear new things. 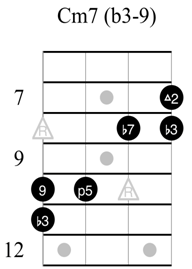 Record yourself playing a Cm7 chord and loop it while you practice the b3-9 arpeggio. If you don’t have the facility to do this, try usingiReal Pro for Mac iOS or Band in a Box for Windows/Mac. 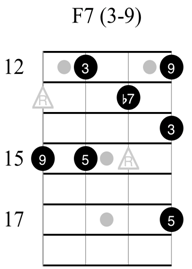 Remember to play the chord associated with each arpeggio before playing the arpeggio itself. 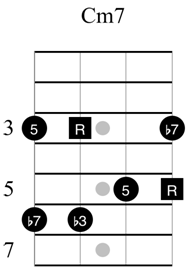 When you are becoming confident with the feel and sound of each arpeggio, repeat this entire lesson, substituting 3-9 arpeggios for the original root position shapes. 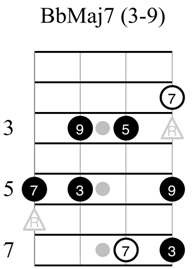 Begin by working on two-string groups before progressing to three- and four-string groupings. 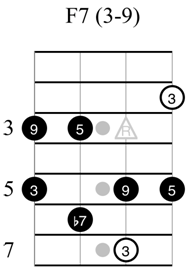 The following exercises show a few ways to link the 3-9 arpeggios over the changes. These are just to get you started. As always, the key to success is for you to explore these ideas in as much detail as you can. As you gain confidence, add 1/8th notes on beat four and gradually increase their frequency as you gain fluency. Remember to start to leave spaces between your phrases and use these ideas to make music. The point of any exercise to help you develop new musical ideas. Simply breaking up these long streams of notes will go a long way towards helping the music come alive. Don’t forget to listen to great players. As your skills develop, you may wish to apply these ideas in other positions on the bass . 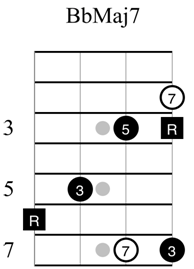 The following chord and arpeggio diagrams will help you to use the previous concepts in new areas. The following positions should not be attempted until you are confident in your ability to apply arpeggios in the first position fluently and from memory.